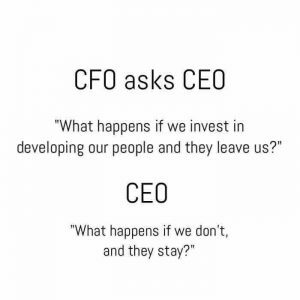 Why Invest in Your Employees? So the economy is doing okay. It’s booming for some and busting for many others. Whatever your company is doing, booming, busting, or somewhere in between, investing in your employees is a must. Now, I know you’ve seen the image above before, probably many times, and it’s cliche notion resonates with many professionals. The thing is, is that it’s true. One of our clients whose business is currently in a busting period, made the strategic decision to continue the investment in developing their leaders. This was not without significant consideration and influence. The argument that ultimately won over the stakeholders was that very few to no other company in their industry would be continuing this investment in their leaders during this economic malaise and making this investment demonstrates their benevolence towards the employees. And, the evidence revealed itself shortly after the conversation when companies laid-off and terminated contracts of tens of thousands of employees. 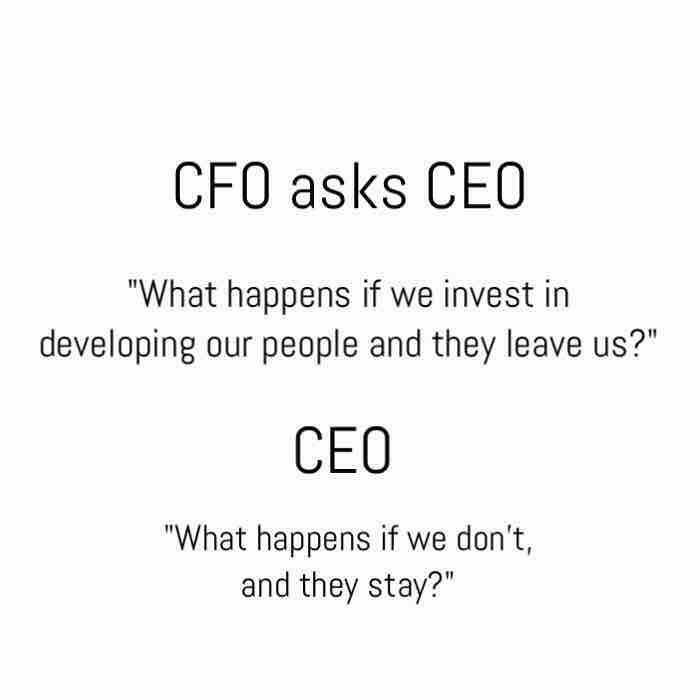 Developing employees, managers, and leaders requires not just a financial investment, but an investment in time and effort. Organizations with successful employee and leadership development programs prepare their employees with lifelong skill sets. They also demonstrate organizational trust and an eagerness to build loyal employees who thrive on growth and want to remain as members of the organization. Studies have shown that companies with employee and leadership development programs are six times more likely to increase employee engagement, and have a 2.5 times higher productivity rate than organizations that have yet to implement a career development strategy (Scales, 2012). They stay with the company because they want to, not solely because they need to. When the economic fog rises in the near future, not only will our client have a ready workforce, but they will be engaged and positioned to scoop up the talent their competitors sent packing. Another study conducted by the World at Work association shared that only 51% of employers feel confident about retention of top talent as the economy improves. Rest assured that out client who made the investment in their leaders has a much higher level of confidence in their ability to retain their top talent and it’s directly related to the investment they’ve made while times weren’t so good. One more thing, they made the Great Place to Work List too in their state. If you’re in a similar position and unsure what do to next let us help you. We put employee and leadership development systems in place with extraordinary development activities, leading towards exponential results. EDGE – Where Leadership Begins, is a Human Capital Consulting firm, focusing on three primary areas to help you achieve exponential growth. We can serve you in many ways, however our focus is in the areas of Talent Management, Organizational Development, and Leadership Development. For immediate inquiries, contact Dan Freschi at (414) 301-3343 or email info@edgebmc.com, and visit our website at www.whereleadershipbegins.com.